Harold Camping. Expected sequence of events. "Family Radio has put up 20,000 billboards around the world, including 85 in major Canadian cities to spread the word and give people a chance to save themselves." "... members of the Family radio group are sure the end of the world is coming on [2011-]May 21. Those who believe in Jesus will be carried into heaven, while the rest of humanity will endure 153 days of 'death and horror' before the world ends on October 21. The group of 10 from Oakland have set out across the country in a convoy of caravans to bring the 'awesome' message of impending doom to as many people as possible. 'Project Caravan', as it has become known, is made up of members of the Family Radio network all of who have given up jobs, families and all their possessions to join this final mission. With T-shirts and banners declaring the 'Awesome News' that Judgment Day is coming, the first convoy of five caravans set off in October last year. They have now been joined by two other convoys, all traveling to different parts of the country spreading their message. The oldest believer on the convoy, 75-year-old Gallegos from Utah, is similar to the rest of the church members. In order to join the trip he had to leave behind a wife of 53 years and be away from his 10 children and their families. "The focus is on the warning that God is sounding to the world through His Word; that He will close the door to salvation on May 21, 2011 when He returns to take his elect children to heaven and begins the day of Judgment on earth for all of those left behind until October 21, 2011 when He will destroy the world and all that is therein." WeCanKnow offers free downloads of a number of ebooks. The web site is still on line as of 2011-OCT, but its emphasis is on the Rapture being at some unspecified date in the future. "... has spent $140,000 -- his entire retirement savings after working 26 years at a desk job -- to buy bus and subway ad placards to alert people to the impending doom." On 2011-APR-14, Patrick Madrid mentioned during his program the Eternal Word Television Network (EWTN) -- broadcast over Sirius satellite radio Channel 160 -- that some followers of Camping were planning to euthanize their pets in advance of MAY-21. They seem to feel that nobody might be left behind to take care of the pets. Caller: Mr. Camping I don’t know what to do, I know I am not a Christian. I do not live right I know I am not a Christian…What should I do Mr. Camping! I cannot think right. You are making me so nervous Mr. Camping what should I do!! What Should I do Mr. Camping! Caller: What should I do Mr. Camping? I am so nervous, I am not a Christian I know I do not live right, what should I do. Maybe I should kill myself? Mr.Camping. Maybe I should kill myself! Harold Camping: Why ask me what you should do? I don’t know. Caller: Maybe I should kill myself! Maybe I should kill myself! 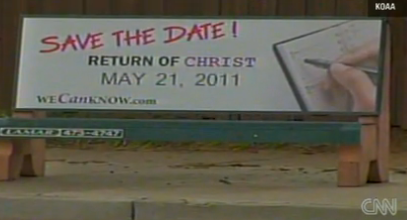 Harold Camping: You may be one of the ones chosen to go to Heaven on May 21… I don’t know. Caller: I don’t live right Mr. Camping….I am so scared. What should I do Mr. Camping? Harold Camping: (in a very low voice) Kill yourself?... Why not cry out to God? (in a very low voice) You should be crying out to God that you are chosen for May 21…You still have time left to cry out to God before May 21. We need to go to our next caller. Shall we take our next call? "... Camping had no answers. No 'Christian' advice. No numbers to play with. A true Christian would have had a real answer for that girl. What a horrible testimony to Jesus Christ that Harold Camping gave. It is shameful. He never once said 'God loves you'." In defense of Mr. Camping, he may have been overwhelmed by the caller. He might not have known how to respond to a suicidal call. Also, by going to the next caller, the program producer would have probably been able to pick up the call and talk to the woman. Hopefully, Family Radio had an emergency procedure to handle suicide callers. Everyone in contact with a person expressing suicidal ideation treat the situation carefully. In advance of need, look up your nearest suicide prevention line in your telephone directory. It should be listed on Page 1. These "hot lines" are generally staffed 24 hours a day by empathic volunteers and have a policy of confidentiality. If you cannot find a local line, calls to the National Suicide Preventon Lifeline at 1-800-273-TALK are routed to the closest available crisis center. Copy down the number and keep it with you in the event that you are faced with a suicidal person. Stay with the person until they settle down or until you can pass them on to a trained support person. We have no idea about the outcome of this distraught woman. Note: None of these events actually happened. Harold Camping's prophecy joins hundreds of other failed predictions of the rapture and/or end of the world. Des Roches estimates that 200 million people -- about 3% of the humans living on Earth on 2011-MAY-21 -- will be raptured. He apparently ignores those born-again Christians who have died in the past and been buried. Most end-times predictions expects the latter to rise from their graves, have their bodies reconstituted into glorified spirit bodies and rise to meet Jesus in the sky during the rapture. They would then be immediately followed by the Christians now living. The 200 million would be approximately 10% of the Christian population. This means that about 97% of the world's population, consisting of non-born again Christians, followers of other religions, and persons who do not identify themselves with a religion will die. They are all predicted to have been exterminated during the horrors of the tribulation between 2011-MAY-21 and OCT-21 when the world and the rest of the universe are to be be destroyed. The dead would total about 6.7 billion people, making this the largest religiously-based genocide in history -- in fact the largest of all genocides. 1 The closest example to the genocide that Camping predicts during the tribulation would be the genocide of the Jewish people by the German Nazis during the 1930's and 1940's. Both would have been mass murder based on what was considered by the perpetrators as a thought crime: believing in the wrong religion. However, Camping's prophecized genocide would involve about 1,000 times the number of people. Australia is a very unlikely area for a massive earthquake. The country has been almost completely quake-free for the past decade. See the USGS Seismic Map which shows earthquakes of various magnitudes worldwide today, yesterday, over the past two weeks, and over the previous 15 years. However, as the map shows, New Zealand is in the "Pacific ring of fire" which includes many other earthquake-prone countries. So, if Camping's predictions had come true, the initial quake might have occurred in or around New Zealand. Camping seems to imply that the first earthquake would have triggered other earthquakes around the world until the land everywhere would have been shaken one or more times, producing millions of deaths. If this happend, it would have been supernaturally caused, because earthquakes are actually triggered by two tectonic plates that had been locked in place and then suddenly break free and slide by each other. The sudden release of energy causes the quake. To have one earthquake trigger many others at exactly 60 minute intervals until the whole world has been shaken would be a truly miraculous event. When we wrote this essay we recommended that If you see it happening, you might want to consider dropping everything and searching the Internet for the topic "How to I get saved." There might have been just time for you to be saved. Camping teaches that after MAY-21, it will not be possible to be saved. However, he apparently does not say whether people can be saved on MAY-21 just after the first earthquakes happen. There is no rational reason why one would anticipate earthquakes at one hour intervals to be propagated around the world. Camping and his followers believe that every grave in the world will be shaken as a result of these earthquakes. This will cause the remains of all of the born-again Christian believers to exit their graves -- a prerequisite for the rapture of living born-again Christians to take place.